Royal Rumble (2003) was the sixteenth annual Royal Rumble professional wrestling pay-per-view (PPV) event produced by World Wrestling Entertainment (WWE). It took place on January 19, 2003, at the Fleet Center in Boston, was the first Royal Rumble produced under the WWE name and employed talent from the Raw and SmackDown! brands. As has been customary since 1993, the Royal Rumble match winner received a match at that year's WrestleMania, (in this instance: WrestleMania XIX) for his brand's World title, either the WWE Championship or the World Heavyweight Championship. The main event was the annual 30-man Royal Rumble match, which included wrestlers from both brands. Brock Lesnar defeated Big Show in the undercard to qualify for the Royal Rumble match later that night, where he entered at number twenty-nine and won the match by last eliminating The Undertaker, the thirtieth entrant. The primary match on the Raw brand was Triple H versus Scott Steiner for the World Heavyweight Championship, which Steiner won by disqualification resulting in Triple H retaining the championship. The most prominent for the SmackDown! brand was between Kurt Angle and Chris Benoit for the WWE Championship, which Angle won by making Benoit submit to the Ankle Lock. The buildup to the Royal Rumble match began on the December 23 episode of Raw, when the Raw General Manager Eric Bischoff discussed about the upcoming Royal Rumble match that 15 wrestlers would represent Raw brand and 15 wrestlers would represent SmackDown brand in the match, because it was going to be the first Royal Rumble match to take place after WWE's brand extension. The buildup continued on the January 2 episode of SmackDown, a vignette aired hyping the return of The Undertaker in the Royal Rumble match. Later that night, Paul Heyman announced that Brock Lesnar and Big Show would wrestle in a Royal Rumble qualification match at the Royal Rumble. On the January 6 episode of Raw, Chris Jericho and Shawn Michaels argued over who would be drawing #1 entry in the Royal Rumble match. On the January 13 episode of Raw, a Royal Rumble qualification match took place in which Jeff Hardy defeated Raven. Later that night, Jericho defeated Batista, Kane and Rob Van Dam in an over the top rope Challenge to earn the right choose an entry number of his choice. Jericho chose #2 because #1 was already given to Michaels. The main feud heading into the event from the SmackDown brand was between Kurt Angle and Chris Benoit over the WWE Championship. At Armageddon, Angle defeated Big Show after interference from Brock Lesnar, to win his third WWE Championship. Prior to the event, Angle had promised Lesnar that he would get his suspension lifted if he had helped Angle in defeating Big Show. Angle had also promised to give Lesnar the first title shot after winning the championship. However, despite helping Angle win the title, Lesnar was not given his title shot as on the December 19 episode of SmackDown, Angle announced that he had hired Paul Heyman as his manager and that the two had conspired to get Lesnar reinstated just prior to Armageddon, only to reinforce a stipulation that Heyman had written into Lesnar's contract that he would not receive a title shot if he had lost to Heyman's other client, Big Show, at Survivor Series. Instead, Angle signed to defend against Big Show, who was irate about being used by Heyman and Angle, but went along due to promises made to him by Heyman. Later that night, Angle lost to Benoit in a non-title match by disqualification when Big Show interfered in the match and attacked Benoit. However, Lesnar rescued Benoit from the post-match assault by Angle and Big Show and brutally assaulted Angle, injuring him. As a result of Angle's injury, the SmackDown General Manager Stephanie McMahon cancelled Angle's title match against Big Show and decided that Big Show would wrestle Benoit to determine the number one contender for the WWE Championship at the Royal Rumble; Benoit won the match. The main rivalry heading into the event from the Raw brand was between Triple H and Scott Steiner over the World Heavyweight Championship. On October 24, 2002, WWE had announced on its official website that Scott Steiner had signed a three-year contract with WWE. After eight years away, Steiner returned to WWE as a free agent at Survivor Series and attacked Matt Hardy and Christopher Nowinski for insulting New York City. Steiner was approached by the Raw General Manager Eric Bischoff and the SmackDown General Manager Stephanie McMahon for their respective brands. He initially decided to join the SmackDown brand but after McMahon rejected Steiner's advances, he moved to the Raw brand. At Armageddon, Triple H defeated Shawn Michaels in a Three Stages of Hell to win the World Heavyweight Championship. On the December 16 episode of Raw, Triple H held an Appreciation Ceremony on winning the title but the ceremony was interrupted by Steiner, who announced that his contract said that he would earn a world title shot. As a result, Steiner and Triple H's match for the World Heavyweight Championship was made official at Royal Rumble. The secondary rivalry heading into the event from the Raw brand was between Lance Storm and William Regal and The Dudley Boyz (Bubba Ray Dudley and D-Von Dudley) over the World Tag Team Championship. On the December 23 episode of Raw, the Raw General Manager Eric Bischoff forced Raw commentators Jim Ross and Jerry Lawler to wrestle in a tag team match against Storm and Regal for making bad comments against Bischoff. Ross and Lawler defeated Storm and Regal after interference by Dudley Boyz. As a result, on the January 6 episode of Raw, Bischoff forced Dudley Boyz to wrestle 3-Minute Warning (Rosey and Jamal), Rico and Batista in a Handicap match. Storm and Regal avenged their loss by costing the Dudley Boyz the match. Later that night, Storm and Regal defeated Booker T and Goldust for the World Tag Team Championship. This led to a title match between Storm and Regal and Dudley Boyz at Royal Rumble. The secondary rivalry heading into the event from the SmackDown brand was between Torrie Wilson and Dawn Marie. At Armageddon, Torrie and Dawn did a lesbian segment in a hotel room. On the December 19 episode of SmackDown, Torrie gave bad remarks about her storyline father Al Wilson on getting married with Dawn. On the January 2 episode of SmackDown, Dawn and Al had their storyline wedding in their undergarments. On the January 9 episode of SmackDown, Josh Mathews announced that Dawn and Torrie would wrestle in a match at Royal Rumble billed as a "Stepmother" vs "Stepdaughter" match. Before the event aired live on pay-per-view, Spike Dudley defeated Steven Richards by pinning him after a Dudley Dog. The match aired live on Sunday Night Heat. The first match was a Royal Rumble qualification match between Big Show and Brock Lesnar. After Paul Heyman distracted Lesnar, Big Show executed a chokeslam on Lesnar for a near-fall. Big Show attempted another chokeslam on Lesnar, but Lesnar countered the move and pushed Big Show into Heyman, causing Heyman to fall off the ring apron. Lesnar executed an F-5 on Big Show to win the match and qualify for the Royal Rumble match. The second match was a tag team match for the World Tag Team Championship between Lance Storm and William Regal and The Dudley Boyz (Bubba Ray Dudley and D-Von Dudley). The Dudley Boyz attempted a 3D on Storm, but Chief Morley interfered in the match and decided that Storm and Regal retained the title by disqualification, but the referee refused and the match continued. Regal attempted to hit The Dudley Boyz with a pair of brass knuckles, but The Dudley Boyz performed a 3D on Regal. D-Von hit Storm with the brass knuckles and pinned him to win the title. The next match was between Torrie Wilson and Dawn Marie. Wilson performed a swinging neckbreaker on Marie to win the match. The fourth match was between Triple H and Scott Steiner for the World Heavyweight Championship. Steiner attempted a Steiner Recliner on Triple H, but Triple H's manager Ric Flair pulled Triple H out of the ring. Steiner chased Flair, but the referee interjected himself to stop Steiner. Triple H attempted a Pedigree on Steiner, but Steiner performed an exploder suplex and attempted a military press slam, but Triple H countered with a neckbreaker for a near-fall. Flair interfered in the match, prompting the referee to eject him from ringside. Triple H threw the referee out of the ring, but the referee did not disqualify Triple H. Triple H hit Steiner with a sledgehammer, meaning Steiner won by disqualification, but Triple H retained the title. After the match, Steiner applied the Steiner Recliner on Triple H.
The next match was between Kurt Angle and Chris Benoit for the WWE Championship. Team Angle (Charlie Haas and Shelton Benjamin) were ejected from ringside before the match. Benoit attempted a diving headbutt on Angle, but Angle avoided the move and attempted an Angle Slam on Benoit, but Benoit countered. Benoit applied the sharpshooter on Angle, but Angle touched the ropes. Angle attempted an Angle Slam, but Benoit countered the move into the Crippler Crossface, but Angle touched the ropes. Benoit applied the ankle lock on Angle, until Angle countered the hold into an ankle lock on Benoit. Benoit countered the hold into the Crippler Crossface, but Angle countered the move into an Angle Slam for a near-fall. Benoit executed a diving headbutt for a near-fall. Angle performed a super Angle Slam for a near-fall. Benoit applied a Crippler Crossface on Angle, but Angle countered it into a modified ankle lock, forcing Benoit to submit to the hold to retain the title. Afterwards, Benoit received a standing ovation for his performance. The main event was the Royal Rumble match. The first two entrants were Shawn Michaels and Chris Jericho. Christian appeared during Jericho's entrance, wearing Jericho's gear and distracted Michaels. Jericho attacked Michaels from behind and hit Michaels with a chair, causing Michaels to bleed. Christopher Nowinski entered at #3 but instead of entering the ring, he stayed outside the ring. Jericho continued to attack Michaels before easily eliminating him. Rey Mysterio entered at #4 and started fighting Jericho while Nowinski stayed out of the ring before eventually attacking Mysterio. Edge entered at #5 and performed Spears on Jericho and Nowinski. He attempted a Spear on Mysterio but Mysterio countered and attempted a 619 on Edge but Edge avoided the move. Mysterio and Edge continued to fight until Christian entered at #6. After entering the ring, Christian embraced with his former tag team partner Edge but was speared by Edge. Edge and Mysterio then performed a double missile dropkick on Nowinski. One half of the then WWE Tag Team Champions Chavo Guerrero entered at #7. After entering the ring, Guerrero was attacked by Mysterio. Mysterio then eliminated Nowinski from the match. However, after eliminating Nowinski, Mysterio himself was eliminated by Jericho. Tajiri entered at #8. Tajiri fought with Christian, while Edge and Jericho fought with each other. Bill DeMott entered at #9. DeMott started attacking all the participants and had nearly eliminated Jericho. Tommy Dreamer entered at #10. Dreamer brought kendo sticks with himself to the ring and started attacking everyone with the kendo sticks. Edge hit DeMott with a kendo stick, causing DeMott to get eliminated by falling over the top rope to the floor. Jericho and Christian attacked Dreamer with trashcan lids and tossed him over the top rope. Tajiri fought with Jericho and attempted to apply a Tarantula on Jericho but his attempt failed and Jericho dumped Tajiri over the top rope, eliminating him. B² entered at #11 but was quickly eliminated by Edge, who then also eliminated Guerrero. Edge also attempted to eliminate Jericho but he held on. Edge and Christian fought each other until Jericho eliminated both of them from the match and became the only remaining person until Rob Van Dam entered at #12. After entering the ring, RVD began attacking Jericho and performed a Rolling Thunder on Jericho. RVD and Jericho continued to battle each other and RVD had nearly eliminated Jericho until Matt Hardy entered at #13 and performed a Side Effect on RVD. Jericho and Hardy double-teamed RVD until second half of then WWE Tag Team Champions Eddie Guerrero entered at #14 and began attacking RVD and Hardy. Guerrero and Hardy double-teamed RVD, where Hardy helped Guerrero from being eliminated and performed a Scoop Slam on RVD, allowing Guerrero to perform a Frog Splash on RVD. However, Hardy ended his teamwork with Guerrero by performing a Twist of Fate. Jeff Hardy entered at #15 and Jeff began fighting Matt. Jeff performed a Twist of Fate on Matt and climbed the top rope to perform a Swanton Bomb, but Matt's manager Shannon Moore joined the ring and covered Matt with his body. Jeff performed a Swanton Bomb on Moore, that hurt both Matt and Moore. Rosey entered at #16 and started fighting with RVD until Test entered at #17 and started attacking everyone in the ring. Test performed a Pumphandle Slam on Matt and began attacking Jericho and had nearly eliminated him. John Cena entered at #18 but instead of entering the ring, Cena began rapping outside the ring until RVD went to the ringside and attacked Cena, tossing him into the ring. Brock Lesnar won the 2003 Royal Rumble match. Charlie Haas entered at #19. Haas started fighting with Matt. RVD and Jeff started double-teaming Jericho. Jeff climbed on the top rope to perform a high-flying move but RVD pushed him, causing Jeff to fall to the floor and get eliminated from the match. Rikishi entered at #20 and started fighting Rosey. Jamal entered at #21 and began teaming with his 3-Minute Warning partner Rosey to double-team Rikishi. Jericho fought with RVD and had nearly eliminated RVD. Kane entered at #22 and started dominating all the participants in the ring and eliminated Rosey by backdropping him over the top rope. After eliminating Rosey, Kane attempted to eliminate Jericho but Jericho held on. Shelton Benjamin entered at #23 and began teaming with his Team Angle partner Haas. Booker T entered at #24 and performed a Scissors Kick on Kane and a Flapjack on Matt. Booker went on to eliminate Guerrero by backdropping him over the top rope. A-Train entered at #25 and started dominating his opponents by performing a Derailer on Cena, a Train Wreck on Benjamin and a Derailer on RVD before receiving a Savate Kick by Rikishi. Shawn Michaels returned to the ring after being attacked by Jericho in the earlier match and avenged his elimination by attacking Jericho, helping Test to eliminate Jericho from the match. Michaels continued to attack Jericho after the match. Maven entered at #26 but was dominated by Kane. Goldust entered at #27 and started battling Haas and Benjamin, but they quickly eliminated him. Goldust's tag team partner Booker tried to avenge his partner's elimination by battling Haas and Benjamin, but he was too eliminated by Haas and Benjamin. Batista entered at #28 and started dominating everyone. Shortly after entering, Batista eliminated Test and then Rikishi. Brock Lesnar entered at #29 and he started fighting all the participants. Lesnar eliminated Haas and Benjamin and then eliminated Matt by tossing him over the top rope onto Haas and Benjamin. Batista and Lesnar then had a stand off due to Batista managing Lesnar earlier in the show. The Undertaker returned to WWE after a three-month injury by entering at #30 as the final entrant of the match. Undertaker quickly eliminated Cena and then eliminated Jamal. Maven attacked Undertaker from behind, trying to eliminate him for the second year running but Undertaker recovered and eliminated Maven. Kane and RVD started to double-team, clotheslining and eliminating A-Train. Afterwards, Kane was going to Gorilla press slam RVD on Batista but Kane instead tossed RVD over the top rope, eliminating him from the match. Kane and Batista started teaming as they were the remaining participants from Raw and battled Lesnar and Undertaker, who were the remaining participants from SmackDown. Undertaker eventually eliminated Batista and then battled Kane before eliminating him. Batista was angered at his elimination, so he distracted Undertaker by attempting to hit him with a chair but Undertaker avoided it and nailed Batista with a chair. Lesnar took advantage of the situation and eliminated a distracted Undertaker to win the Royal Rumble match. Due to winning the Royal Rumble match, Brock Lesnar earned a WWE Championship match at WrestleMania. As a result, he began a rivalry with the WWE Champion Kurt Angle. Chris Benoit also continued his rivalry with Angle after losing to him at Royal Rumble. At No Way Out, Lesnar, Benoit and Edge were scheduled to take on Team Angle (Kurt Angle, Charlie Haas and Shelton Benjamin) in a six-man tag team match, but Edge was injured before the event. As a result, the match became a handicap match but Lesnar and Benoit managed to defeat Team Angle. At WrestleMania XIX, Lesnar defeated Angle to win the WWE Championship. After retaining the World Heavyweight Championship against Scott Steiner by getting disqualified, Triple H continued his rivalry with Steiner over the title. On the February 3 episode of Raw, Steiner became the number one contender for the title by defeating Chris Jericho. At No Way Out, Triple H defeated Steiner to retain the title. ^ a b c d e f g h i j "Royal Rumble Event Results". Pro Wrestling History. Retrieved 2009-07-09. ^ a b c "Brock Lesnar (spot No. 29) wins the Royal Rumble Match". World Wrestling Entertainment. January 23, 2003. Retrieved 2010-11-28. ^ a b c d e f g h "Royal Rumble 2003 official results". World Wrestling Entertainment. January 19, 2003. Retrieved 2010-11-28. 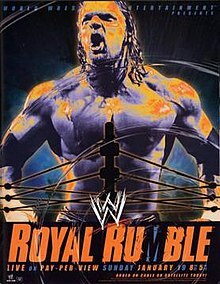 ^ a b c d e f g h i j "Royal Rumble 2003 results". Online World of Wrestling. January 19, 2003. Retrieved 2010-11-28. ^ a b "WWE Raw Report". PWWEW.net. December 23, 2002. Retrieved 2010-11-15. ^ a b "WWE SmackDown Report". PWWEW.net. January 2, 2003. Retrieved 2010-11-15. ^ a b "WWE Raw Report". PWWEW.net. January 6, 2003. Retrieved 2010-11-15. ^ "WWE Raw Report". PWWEW.net. January 13, 2003. Retrieved 2010-11-15. ^ a b "Armageddon 2002 official results". World Wrestling Entertainment. December 15, 2002. Retrieved 2010-11-28. ^ a b c "Armageddon 2002 results". Online World of Wrestling. December 15, 2002. Retrieved 2010-11-28. ^ a b "WWE SmackDown Report". PWWEW.net. December 12, 2002. Retrieved 2010-11-15. ^ a b "WWE SmackDown Report". PWWEW.net. December 19, 2002. Retrieved 2010-11-15. ^ "WWE SmackDown Report". PWWEW.net. December 26, 2002. Retrieved 2010-11-15. ^ "Wrestler Profiles: Scott Steiner". Online World of Wrestling. Retrieved 2010-11-28. ^ "Survivor Series 2002 results". Online World of Wrestling. November 17, 2002. Archived from the original on June 29, 2012. Retrieved 2010-11-28. ^ "WWE Raw Report". PWWEW.net. December 2, 2002. Retrieved 2010-11-15. ^ "Triple H vs. Shawn Michaels in a Three Stages of Hell Match for the World Heavyweight Championship". World Wrestling Entertainment. December 15, 2002. Retrieved 2010-11-28. ^ "WWE Raw Report". PWWEW.net. December 16, 2002. Retrieved 2010-11-15. ^ "WWE SmackDown Report". PWWEW.net. January 9, 2003. Retrieved 2010-11-15. ^ "Wrestler Profiles: Edge". Online World of Wrestling. Retrieved 2010-12-01. ^ a b "No Way Out 2003 official results". World Wrestling Entertainment. February 16, 2003. Retrieved 2010-12-01. ^ "Brock Lesnar vs. Kurt Angle for the WWE Championship". World Wrestling Entertainment. March 30, 2003. Retrieved 2010-12-01. ^ "Royal Rumble Elimination Info". Pro Wrestling History. 2009-07-09. This page was last edited on 17 April 2019, at 12:12 (UTC).